I am extremely passionate about providing a holistic experience to all clients I work with, which has only been strengthened by my close and involved work with a multitude of startup business throughout California over the past two and a half years. I have advised clients from a broad spectrum of industries on everything from acquisitions, contract review and negotiation, private placements, debt and equity financing, and corporate governance, to trademark protection and compliance with the EU General Data Protection Regulation (GDPR). 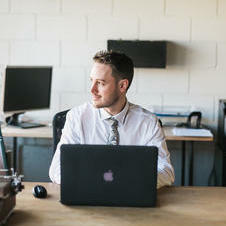 "After a thorough evaluation of multiple law firms, I decided to work with For Purpose Law specifically with Kieran on incorporating a benefit corporation and now with trademark search. He has been incredibly diligent, insightful and thoughtful throughout the entire process. I have worked with many lawyers in the past, so I know how important it is to pick someone who understands your goals, not just the law. Kieran has given me insight into challenges we may have run into, allowing me to make the the best educated decision for my business. He is also attentive and always gets back to me same day. I would highly recommend Kieran and this group." "Setting up a nonprofit 501c3 is complicated, but Kieran made it understandable and logical. He was efficient, used plain English, was responsive, understanding, and thoughtful. He prepared all the documents to submit to the IRS-made it as easy as could be expected. I highly recommend working with Kieran." I work with small to mid-size nonprofit and startup for-profit clients to assist them in overcoming legal challenges and achieving results. IP, contracts, compliance, data privacy, and legal structuring are my forte. I believe in working collaboratively with my clients through the nuances of whatever aspect of law we are tackling so that the process can be tailored to the client's unique goals. Managed Corporate Formation, Governance, Non-profit, Privacy, and Trademark practice areas. Expanded practice into Privacy and Securities law. Advised startup for-profit, nonprofit, and creative clients. Counseled clients on corporate formation, governance, capital raising, IP prosecution and protection, including trademark strategy. Advised software startups on EU data privacy compliance.